Can I buy just one JohnnyBoard for one month just to try it out? No. We believe that advertising is a marathon, not a sprint. Unless you plan to be in business for only one month, you should plan for a long-term reach regardless what media use. Our typical small business client buys at least 35 JohnnyBoards for six months that are placed various locations to fit their demographic needs. What is the shortest length of time I can buy JohnnyBoards? Special events such as festivals can buy JohnnyBoards for as short as 2 months to promote their event. However, we recommend small businesses to make a 6 or 12 month buy to take advantage of annual discount rates and to build frequency with their target audience. If I buy for 6 months or 12 months, do I have to keep the same design up? No. If you change your ad monthly, you pay the production and posting fee of $4 per ad space. If you wait and post a new design at the end of each quarter, there is no charge. Your first posting and production fee is included in the media cost. How do I buy JohnnyBoards as a government agency or non-profit? Check with your ad agency first. If you don’t have one, check with your department’s media buyer or call us directly. All qualifying agencies get the PSA rate to buy 2 get the 3rd ad free with a 50 JohnnyBoard minimum. How and why would I write JohnnyBoards into grants? JohnnyBoards is an approved DBE (Disadvantage Business) through the DOT (Department of Transportation). All other government agencies recognize our Small Business Administration DBE certification. Writing JohnnyBoards advertising as part of your media buy into your grant proposal may help the state reach federally mandated goals for working with DBEs, and increase your organizations likelihood of receiving grants. Call us for any questions. 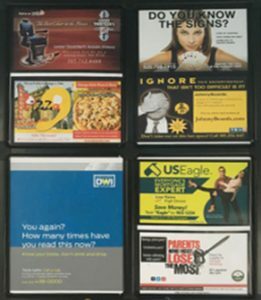 We also have many PSA ads for various agencies. What if my client’s reputation, product or service high standard don’t care to advertise in a bathroom? Verizon, State Farm, Budweiser, and Life Lock, all leaders in their category, advertise on our media nationwide. We do realize it can seem like a risk for those not familiar with the power of our media, but that’s where a great ad agency can help their client understand the long term value of branding their product or service by adding JohnnyBoards to their media mix. Those who have given us a chance are rewarded with our loyalty and exclusivity for the life of our relationship and have the opportunity to grow with us. What’s the ROI and CPM of your media? At JohnnyBoards we take pride in the simplicity of our media. We could spend a lot of money buying survey data or commissioning independent audits, but these costs would be passed on to our advertisers by way of higher rates. We choose not to burden our customers with this, and take a more common sense approach. At $12.50 per month, your ad cost is 42 cents per day. If 10 people see it per day, you’re spending 4.2 cents to reach your target demographic for an average of 2 minutes of exclusive attention to your ad. If 15 people see each ad in a day, it costs 2.8 cents per impression! The value of JohnnyBoards advertising is its target-ability and minimal waste. You know who is exposed to your ads and are not paying to reach thousands who are not in your target market. What is the Agency discount? Allowance for a standard 15% agency commission is extended to all recognized advertising agencies on contracts of 150 ads or more, with a minimum of 3 months. NTTC will be required for exemption from NMGRT.